Why 21 years specifically? According to Giraldo Piloto, he and the band were too busy with other projects to get a new album out in time for 20 years. This album was worth the wait, however. Mis 21 Años is an inspiring collection of new arrangements (using different guest vocalists) of hits from different periods in the history of Klimax as well as some new compositions. In addition to the intense Timba for which Klimax is renowned, there are also a couple of beautiful boleros. As you can see from the credits, quite a few elite vocalists took part in this project. All of the compositions are Piloto's except for Añorado Encuentro, which he co-wrote with Leo Vera. The arrangements, on the other hand, are divided as shown in the track list, and the depth of the arrangements is still an extremely important feature of what sets Klimax apart from so many other bands. This is a band for musicians as well as for dancers with bits of Rumba, Funk and Jazz woven into the fabric of the songs without making the songs any less danceable. Most importantly for me, there is genuine VARIETY in the album - in the tempos, the rhythms - that would make the album worthwhile even for people who can't dance. 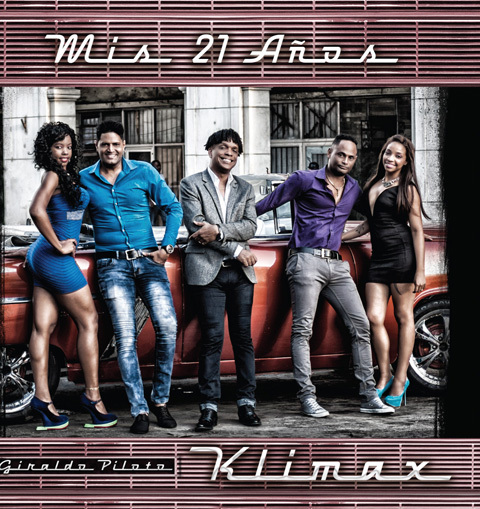 Mis 21 Años was awarded the Premio Cubadisco this year (2017) in the Popular Dance Music - Masters category, and it had some stiff competition this year. I would not hesitate to use this recording as an exhibit to prove that the genre of Timba still has a lot of life in it when it performed by those who are genuinely committed to it. Here's a video taste of La Ventana. There is an impressive collection of other videos in the Giraldo Piloto y Klimax Offical Channel in YouTube.